Instrument Technology, Volume 3: Telemetering and Automatic Control deals with advances in telemetering instruments used in automatic control of industrial processes. The focus is on instruments used to transmit to a control room an indication of the value of a measured variable, and on instruments and mechanisms used to control process variables. The basic physical principles are discussed and the actual instruments are classified according to the principle upon which they are based. 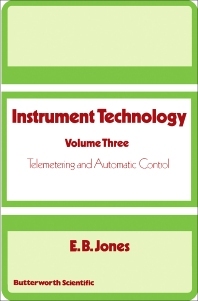 This volume consists of two chapters and begins with an overview of telemetering and pneumatic methods of telemetering. Electrical telemetering systems are described in terms of telemetering by variation of an electrical quantity, balanced bridge systems, and position systems. The second chapter discusses the theory of automatic control and illustrates the automation of temperature control in furnaces. The construction and operation of some of the simple, self-acting process controllers are explained and the more elaborate controllers are described. This monograph will be useful to students and those involved in the craft and science of instrumentation.